This discovery may be a few weeks late, but let me assure you its completely worth it. When it was supposedly still summer, by that I mean a day of rain storms, Boy and I popped off to see a film at the pop-up cinema in Battersea Power Station. I believe the cinema has since gone so we won't worry about that, but there was a whole host of different food vendors to explore. In between rain storms and roaring thunder, we ducked in and out of the stalls to see what was on offer. I had my heart (and stomach) set on a burger so set out to find something that tickled my fancy. 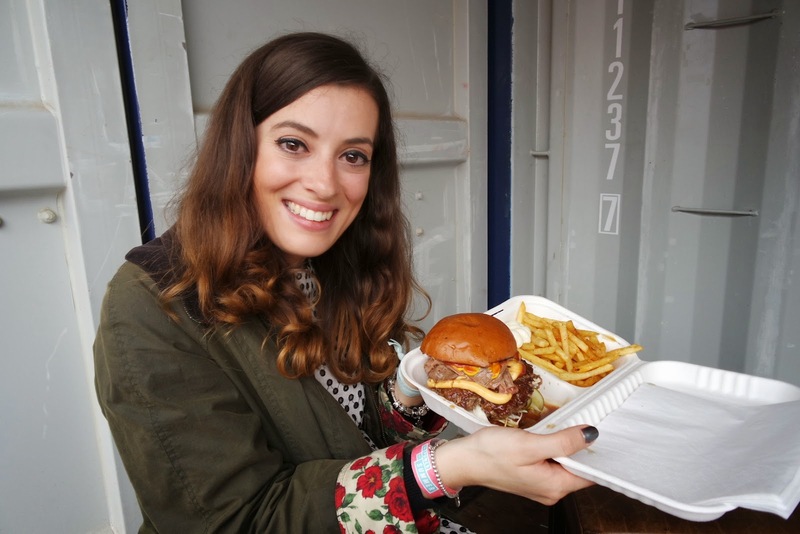 There were a few of the more well-known burger vans, one in particular we were keen to try, but with the chef standing there flexing his muscles and chatting to a friend I decided against it. We went for Dip & Flip, mainly after eyeing up the grills and seeing the sheer size of the burgers! And it did not disappoint, this was without a doubt the most juicy and moist burger I've ever eaten. Possibly the messiest also. The 'Dip' side of Dip & Flip menu comprises of an American French Dip, a hot meat sandwich where thinly sliced cuts of meat are served with a cup of jus-based gravy. And the 'Flip' side, burgers served with gravy! The 'Dip & Flip burger' comprises of a cheese burger, topped with sliced roast beef and gravy, ketchup, mustard, cabbage and pickles. The patties are thick, well-seasoned and juicy. The brioche-type bun miraculously manages to retain its shape with all the gravy. And its worth noting that the staff were incredibly polite, helpful and attentive when ordering. I may have gone back for more napkins with gravy down my dress, but they assured me I wasn't the first gravy victim! If you fancy giving it a try, their restaurant can be found near Clapham Junction Station, find out there info from urbanspoon below.